On a rainy day I like to get some store flowers and let my creativity flow. 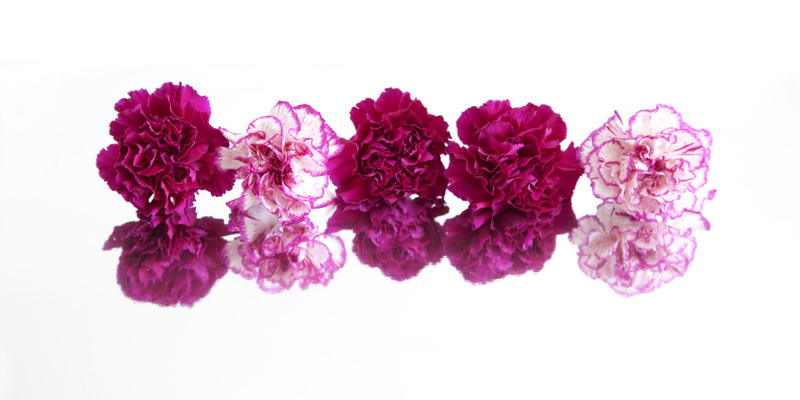 I found these wonderful variegated carnations and took them home. You can ususally find Mylar sheets (or other shiny silver sheet) at arts and crafts stores. The wedding section has some fun products and the scrapbooking section is full of possible backgrounds. Some office supply stores even have large sheets of silver coated material. You can also use a mirror but that tends to be too harsh a reflection for my taste. So, carefully cut the flowers almost to the bloom to help avoid getting any of the green stem in your shot. Then snuggle them up next to each other on your reflective surface. The paper should curl up behind the blooms. Set your camera eye level on tripod with the blooms and use a shallow depth-of-field (f/5.6) to get detail just in the blooms.. I like the reflection just a bit blurred to give a sense that the flowers are laying on something, not just floating in thin air! I used Levels in Photoshop to make the silver turn white. Of course this idea will work on a multitude of subjects! Susan, As always you continue to be imaginative in different ways to photograph subjects. Always interesting what you come up with next. Thanks for your ideas. Thanks for the ideas. I was going to buy some black plexiglass online but hadn’t done so. I’ll see what they have at my local Joanne’s. Saw a beautiful portrait of a young lady resting on the glass and the reflection was great. Thanks for your ideas.